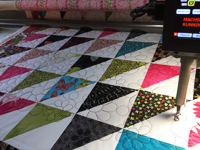 Aerie Designs offers custom quilting services to quilters nationwide. We use our Innova long arm, equipped with AutoPilot MACH3 (Innova’s newest computerized robotic system) to create a beautiful quilting that complements your quilt. 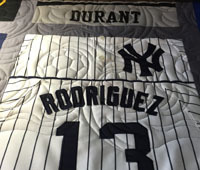 Depending on your budget, we can provide edge-to-edge quilting, complete custom quilting, or a combination of the two. Edge-to-edge (E2E) patterns are sewn literally from edge to edge, top to bottom, and may stitch off the edges of the quilt top. 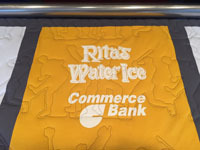 Custom quilting includes designs quilted within blocks, sashings, or borders and may be completed by using computerized and/or hand guided quilting techniques. Our standard turnaround time for quilting is approximately four weeks. Express Service is available for an additional fee. 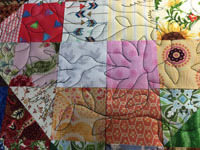 Click here for information on how to prepare your quilt top for Aerie Designs to quilt. We can also bind your quilt for you using your fabric or our fabric cut either with the grain or on the bias. Turnaround time for binding is approximately an additional two weeks. Interested in hand quilting your top or quilting it on your domestic sewing machine? We can baste your quilt sandwich for these applications. In many instances, Aerie Designs can accommodate rush quilting jobs. There is a minimum $50 rush fee (in addition to quilting and other service fees), which is due at the time the quilt is received by Aerie Designs for services. Contact us today to discuss your project and secure your place on our schedule.